West End Dumplings: Arlington Bridge: What about that Nile connection ? Arlington Bridge: What about that Nile connection ? 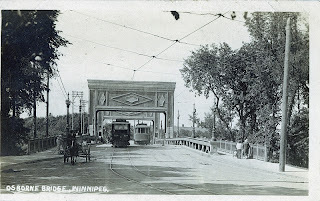 This is the last of a four part series on the history of Winnipeg's Arlington Street Bridge commemorating the centenary of her opening on February 5, 1912. 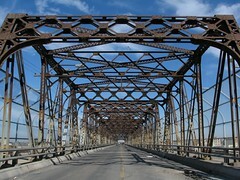 Many Winnipeggers are familiar with the story that the Arlington Bridge was originally built to cross the Nile River. Details vary but the core of the story said that it was built by Cleveland Bridge and Iron Works in the U.K. but left unclaimed and sold to Winnipeg on the cheap. The story has since been dismissed as "urban legend" for the fact that no city documents or media reports of the day make mention of it, which is true. How did this legend get started and could there be something to i? To find how this story got started, I've searched the Free Press archives, select periods from the Tribune archives and have gone through years of city council minutes and city bylaws at the Winnipeg Archives. "The Arlington street bridge will always be a bugbear. It was built to go across the Nile river, but it was peddled off to the city of Winnipeg. 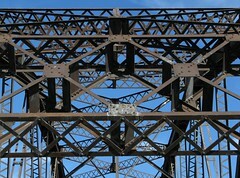 The sooner the bridge comes down and a modern one goes up, the sooner will the city maintain expenses." July 30, 1946. Winnipeg Free Press. This, and subsequent references to the Nile, were not done in a boastful or romantic way, bit rather as a warning to fellow city officials not to buy something on the cheap thinking that it will save money. “But for a whim of fate, the old Arlington Bridge, instead of being covered with snow and ice, would have had crocodiles playfully nipping at its piers." The reporter went to see the city's chief engineer William D. Hurst to ask if the city would consider buying this new bridge should the contract go bad. Hurst confirmed that the Arlington Bridge was originally intended for the Nile and that purchasing a pre-existing superstructure was the reason for the bridge's steep grade and other shortcomings which had caused numerous headaches for the city. The first article I can find that attempts to investigate the Nile connection appears in the January 11, 1969 Winnipeg Free Press. Reporter Carmen-Litta Magnus looked through newspaper stories from the 1909 - 1912 era and found no reference to it being a previously built structure. 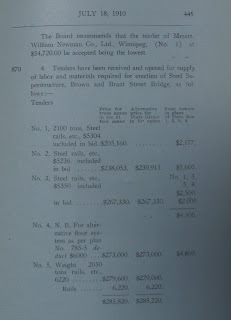 She contacted Cleveland Bridge who informed her that they had no corporate records showing the construction of an Arlington Street Bridge (or any bridge) in Winnipeg during that period. She followed up with city engineer Hurst, who said that when he began working in the city engineering department in the 1930s the Nile connection was well known and spoken about, but admitted that he had never seen anything in writing that could prove it. He said that the story of a pre-existing structure didn't seem odd to him considering how low Cleveland's bid price was. From that point onward, any reporting of the Nile connection was considered unlikely and by the 1980s was deemed to be nothing more than urban legend. After researching the story, I have to admit that I haven't come across any "smoking gun" that points directly at a Nile connection. There is, however a lot of circumstntialare some questions that I've not been able to find answers for, though. 1. Why the Nile ? If "the Nile" reference was something pulled out of thin air, it was certainly a good guess as there was a strong connection between north Africa and Cleveland Bridge. In the period between 1903 and 1913, four decades before the 1946 Nile claim by Hurst and in the lead up to the opening of the Arlington Bridge, the British were busy colonizing North Africa. This meant constructing thousands of kilometres of rail lines and roadways and dozens of bridges.A main player in the construction of the bridges was none other than Cleveland Bridge. In fact, they hired F. W. Stephen, an engineer who was originally posted to the region as part of the British military, to be their key man from 1907 - 1910. 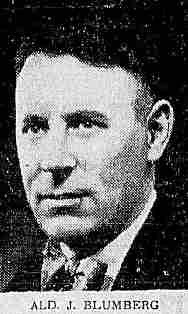 Another military engineer, George Ronald Storrar, was sometimes subcontracted to Cleveland Bridge during this same period. Blue Nile Bridge, Khartoum, Sudan (built in 1909) Source. Around the time that the Arlington Bridge was put to tender, the British and Cleveland Bridge were heavily involved not so much in Egypt and the Nile River proper, but in Sudan and two of the Nile's tributaries, the White Nile and Blue Nile rivers. The Blue Nile Bridge in Khartoum (above) is one project built around the same time as the Arlington and still in use today, (and the story there is that it, too, was not originally intended for that site!) Another area brige built at the time is the Omdurmn Bridge in Sudan. Note that these bridges were all meant to go over water, not rail yards. A repair that had to repeated numerous times to the Arlington Bridge in the 1930s and 1940s was replacing iron that was corroded by the acrid smoke from locomotive engines. It wasn't until 1948 that the city finally solved the problem by spending $50,000 to install 'blast plates' to shield the bridge's undercarriage from the smoke. 2. Were Any Bridges Unused ? I can't find a direct reference to a British bridge going unused, but there likely were. Histories of the region during this period speak of warring locals, political interference and bad planning which all interfered with British infrastructure projects, to the point that some had to be put off or moved to new locations. Also, there was a new British policy that made colonies "pay their own way" when it came to infrastructure projects. In this case, it meant that the government of Egypt and Sudan, not the deep coffers of Britain, were responsible for seeing that projects were paid for. In The Railway Conquest of the World (1911), F. A. Talbot writes of the difficulties that bridge builders had spanning the Nile and her tributaries. In one spot, "A considerable quantity of scaffolding intended for the support of the steel bridge during erection was torn up and hurried down-stream." The Sudan under Wingate details a number of uprisings by "peasants" or religious groups that in some cases led to bloodshed along the territories that the British were colonizing. In Empire on the Nile: The Anglo-Egyptian Sudan, 1898-1934, Daly recounts a number of stops and starts to railway construction due to lack of funds or political gamesmanship. 3. What about Cleveland's Bid ? In Magnus' Free Press story, city engineer Hurst says that the purchase of a pre-existing structure did not seem odd to him considering how low Cleveland Bridge's bid price was. Above are the results of the call for tenders for the Arlington Bridge found in the City of Winnipeg bylaws. Bid number "1" is Cleveland Bridge at $205,160 which is $33,000 cheaper than its nearest competitor. Also of interest is the fact that Cleveland supplied a price for just "option one", the truss spans bridge, and nothing at all for the alternate 'plate girder' design. Why did Cleveland supply a bid for just the one style of bridge when their competition all presented bids for both options? Osborne Bridge ca 1913. Source. If Cleveland Bridge could bid so much cheaper than even local competitors for our bridges why, then, did they not bid on contracts for other Winnipeg bridges let around the same time? A search of newspaper stories from the period indicate that of the Redwood (1909), Louise (1911), Osborne Street (1912) and Elm Park (1914) bridges, the only one bid for by Cleveland Bridge was the Osborne Bridge. They lost to Manitoba Bridge and Iron Works which had the lowest bid. I was hoping that in city documents or newspaper stories I could have found out, one way or another, an answer to the true origins of the Arlington Bridge. I couldn't. 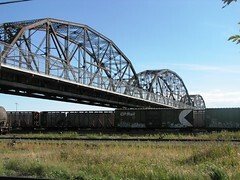 It does appear that the bridge was not well suited for its crossing over the CPR yards in central Winnipeg, requiring a never ending series of major repairs from shortly after the time it opened. (See the earlier parts in this blog series for more details. )There is a lot of circumstantial evidence that points to the possibility that this bridge structure may be tied to the work that Cleveland Bridge was doing in Sudan around the same time that the tender was called. I still think that this connection is quite plausible. Perhaps one day a more definitive anser can be found. Did Bob Hope play his first round of golf In Winnipeg? My late Grandfather who worked in the CP yards under that bridge his whole career told me many times about the Nile connection. It was a common knowledge/story to the CP workers he said. - they didn't bid on other bridges at the time because they couldn't come up with that much of a savings again, and had to clear the Nile bridge off their books/plate first. In any event until I get proof otherwise, it's a Nile bridge to me! the best urban legends are those that can't be debunked. it's sometimes the not knowing that makes a local legend 'romantic'. thanks for your great research as always.....i believe. I heard it was supposed to go across the Suez Canal. just found this article ... and after visiting my 92 year old uncle in Edmonton, thought i would comment... yes there is a connection. My mother and uncle were Foggs, and grew up on Home Street (it was their house that all the hoses were hooked up to to flood the ice at Orioles). When she married, she and Dad bought the house and we grew up there too. As my grandfather had died (he was the original manager of the Pantages Theatre, and an organizer of the Eatons Santa Claus parade), my grandmother and another uncle remained in our house in a suite on the second floor. ... so I grew up hearing family stories (Orioles, Pantages, Robby Burns, etc, etc) from my mom and grandma. Grandma's father was Sandy Jamieson (one of the men responsible for the Robbie Burns statue at the Leg) and he was a mason (real bricks, too) and worked in construction ... and one of the structures he was involved in working on was the Arlington Bridge ... which I grew up hearing had been originally meant for the Nile River. I knew my great grandfather a bit, but was too young to think to ask him if this story was true ... but it did come down through his daughter to his grand daughter to me ... just had to add this to your notes. ... he also worked on the Eaton's building and my cousin and i were given a few bricks from a worker on site when it was demolished. Hi, Elizabeth. Thanks for your addition to the story. Very interesting !